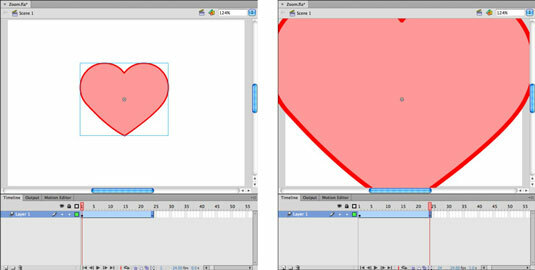 Some of the most common effects in Adobe Flash CS6 — such as zoom, flip, lean, and spin — are all different types of transformations, or changes to a symbol’s dimensions, rotation, or skew. You can perform transformations on a symbol from the Tools panel, Transform panel, or Modify menu and combine transformations for many animation possibilities. With the shape selected, choose Modify→Convert to Symbol. Enter a name for the symbol in the Name text box, (for example, type Zoom Shape), select Graphic from the Type drop-down list, and click OK. The symbol is added to your library and is ready to be used as part of a motion tween. Select the first keyframe; right-click and choose Create Motion Tween from the contextual menu that appears. A new tween span is created on the layer. If you’re working with the default frame rate of 24 fps, the tween span should be exactly 24 frames long. Click the frame ruler above the Timeline at Frame 24 to reposition the playhead at this point. Choose Window→Transform to open the Transform panel. From the panel, enter 300% in the Scale Width and Scale Height text boxes. The new keyframe that’s created automatically at Frame 24 within the tween span marks the change in scaling you’ve just made. The instance slowly increases in scale, creating the illusion that you’re zooming in closer to the object. The zoom-out effect is identical to the animation you just created — but in reverse. Rather than start with the smaller symbol instance, you start with the larger one and gradually pull away by tweening into the smaller one. Rather than create a new animation, you can copy and reverse the existing one by using a few handy shortcuts from the Timeline menu, which appears when you right-click (Windows) or Control-click (Mac) a frame. On the same layer as the existing tween, right-click Frame 48 and choose Insert Frame to add frames and extend the current “zoom-in” tween. Inserting frames after a motion tween span is an effective way of extending that tween without shifting existing keyframes. Select the next empty frame on the same layer. If your tween span is 24 frames long, it’s Frame 25. Right-click and choose Paste Frames from the contextual menu that appears. A copy of the tween span is pasted back-to-back with the existing one. Right-click the new tween span and choose Reverse Keyframes from the contextual menu that appears. Click Frame 1 and then press Enter or Return to play back your animation. The zoom-in effect plays, followed immediately by the exact reverse (zoom-out).